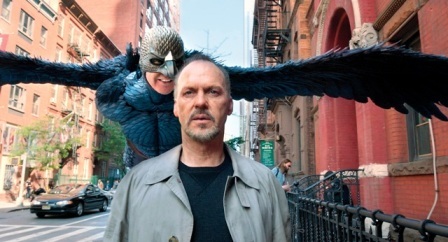 Riggan Thompson (Michael Keaton, front) is always haunted by Birdman. Mexican filmmaker Alejandro González Iñárritu had already been a known commodity in Hollywood circles for a while. His debut feature, Amores Perros, became a fan favorite, while his U.S. projects 21 Grams, Babel, and Biutiful landed him the star power of Brad Pitt, Cate Blanchett, Sean Penn, or Javier Bardem. With his fifth movie, Birdman: Or (The Unexpected Virtue Of Ignorance), he has firmly established himself as one of the premier talents behind the camera stateside. The film won four prestigious Academy Awards for Best Motion Picture, Best Director, Best Original Screenplay, and Best Cinematography – but how good is Birdman really?